My mom has one Christmas memory that she has shared over and over with me. She was born in 1926, so she was only 3 when the Great Depression hit. Her family, like everyone else, was put under extreme financial stress. Her folks rented out the home they owned in Santa Barbara and moved into a rented home in Summerland that had no indoor plumbing. They shared the house with members of their extended family – my mom’s Aunt Wini and her children. Mom says the rent was $10 per month. The men in the family couldn’t find work, so the women got jobs in the citrus packing house. My grandmother Gladis took the job of picking the rotten fruits out of the citrus bins, because the messy, disgusting work paid a little more than the other jobs. When Mom was about 5 and her older brother, Earl, was 7, they were playing around one day. She was in the house and he was outside. She started making faces at him from inside the large picture window. He got angry and, in a typical dumb 7-year-old move, threw a baseball at her. The window shattered and they both got whippings. But worse – they were told that Christmas – which was still a few months away – was cancelled. The family would have to use every spare dime to pay the landlord to replace the window and there would be no money for presents. The children had plenty of time to contemplate the misery that was sure to be Christmas morning. That day would dawn without a single present, without anything special to mark that occasion. But when they awoke, they found something wonderful. Somehow the family had managed to put together just enough money to buy a little red wagon. One present for all the children. But what joy that one unexpected present brought! Suddenly Christmas was theirs. My mom said they gave each other rides and put the animals and their friends in the wagon and went up and down the hill and played and played and played until they couldn’t play anymore. I don’t remember ever hearing about any other Christmases my mom had, but I have heard the story of the unexpected wagon every single year. Merry Christmas, everyone. I hope your day is full of unexpected joy and fun. Photo by Jason Hickey. Used under a Creative Commons license. ← Shepherds, Why This Jubilee? The unexpected makes the best memories. Spending a strange Christmas this year and I’m loving most parts of it! I’m glad to hear that Christmas, while strange, is still good. Wow, that’s a great story. It’s so interesting how expectations shape how we feel about things. I need to put some thought into this for my kids. Thank you for this. Yes, next year, start saying NO CHRISTMAS in about October. Let me know how that goes. LOL. Merry Christmas! It’s Christmas!!! I wish it would stop raining, but still: CHRISTMAS! It’s about to start raining here again. Merry Christmas! 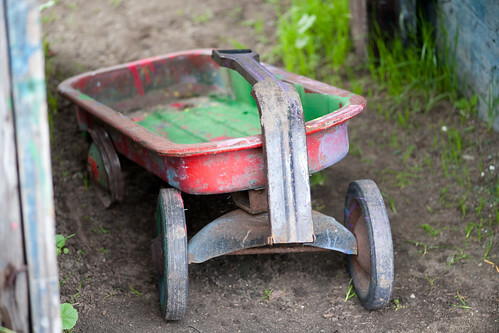 I love little red wagons and I love this story! Even so many years later, she can’t forget that present. And neither will you. One year, my husband bought me a pair of sewing scissors for Christmas. At the time, I thought it was cheap and mean-spirited, but I still have those scissors, and I think of that Christmas every time I pick them up. Men seem to love getting practical gifts…it’s a chasm between the way men think and the way women think.